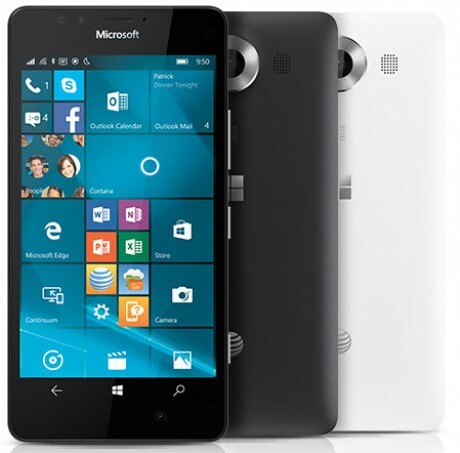 AT&T today said the Microsoft Lumia 950 smartphone will be available online Nov. 17 and in stores Nov. 20. The 950 is the first handset to run Windows 10 Mobile. Some of the core features include a 5.2-inch quad HD display; Snapdragon 808 processor with 3GB of RAM and 32GB of storage; 20-megapixel main camera and 5-megapixel front camera with 4K video capture; and a QuickCharge 3,000mAh battery. AT&T is offering a handful of financing methods for the Lumia 950. First, AT&T will sell it for $149.99 with a two-year contract ($45 activation fee req'd). Second, AT&T will sell it via monthly installments with an AT&T Next plan ($15 activation fee req'd). Customers can get the 950 for $19.97 per month with a Next 24 plan, $24.96 per month with Next 18, or $29.95 per month with Next 12. The full retail price is $599. The Lumia 950 will be available in matte black or matte white. The smartphone works like a PC when paired with the Microsoft Display Dock HD-500 (sold separately). AT&T did not say if or when the Lumia 950 XL will go on sale. Microsoft's first Windows 10 Mobile handset, the Lumia 950, is here at last. This device boasts a beautiful screen and powerful camera, and includes unique features such as iris recognition biometrics and the ability to act as a full, desktop computer.